Krispy Kreme Singapore Launches the Hazelnut Original Glaze piped with Nutella. Krispy Kreme Singapore launched the Hazelnut Original Glaze doughnuts yesterday morning. We woke up early and headed to their outlet at Northpoint City to try the new flavour here in Singapore. The Hazelnut OG is piped with Nutella, which is another favourite of ours. Priced at S$3.30 each or a dozen for S$33. 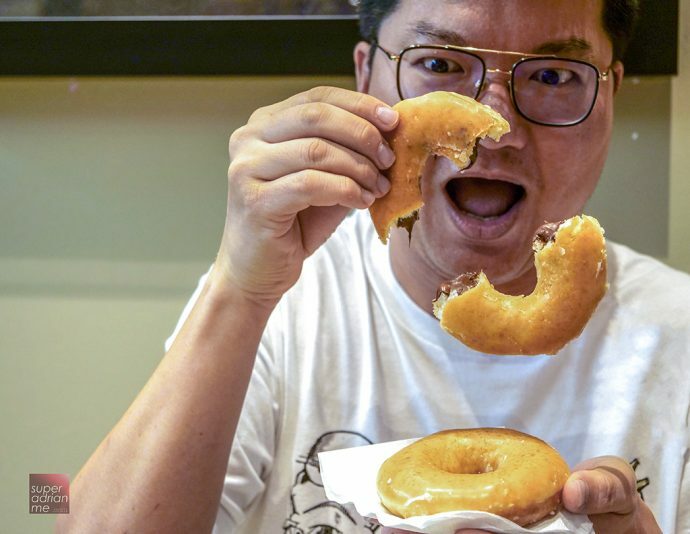 We did a taste test of the new Hazelnut Original Glazed doughnuts from Singapore Krispy Kreme. Was it worth the S$3.30 for this Nutella-filled doughnuts? Check out our video below. It goes well with a cuppa coffee.